Somm's work intersects between Impressionism, Symbolism and Japonism. François Clément Sommier, best known under the pseudonym “Henry Somm,” was born in Rouen in 1844. He attended the local École municipale des beaux-arts and went on in 1867 to Paris, where he studied under Isidore Pils (1813-1875). “Somm is above all a painter and his watercolors are much sought after; he has the painter’s eye to the highest degree imaginable.” Louis Morin, Somm’s fellow artist revealed in 1893 that while his training as an academic painter forged his draughsmanship and an acute eye for colors, Somm preferred and excelled in the graphic realm. Particularly prolific, he produced a very extensive corpus of 7,500 drawings and prints, many of which were widely reproduced in journals and magazines. In 1867, Somm’s career reached a turning point with the discovery of Japanese culture through his friendship with French collector and critic Philippe Burty and a visit to the Paris International Exhibition. More generally, Japanese art and especially Japanese woodblock prints exerted a heavy influence on French artists at the time, and especially on the Impressionists, who were particularly inspired by the subject matter, as well as the innovative use of perspective, composition and color. Although technically not an Impressionist by pure definition, Somm’s interest in the effect of atmospheric light on shadow and color prompted Edgar Degas to invite him to participate in their 4th exhibition in 1879. However, Somm did not exhibit again with the Impressionists, and was never considered a member of the group. Rather, his work intersects between Impressionism, Symbolism and Japonism. In fact, while his drypoints and etchings reflect a more literal borrowing of Japanese elements than the work of Whistler or Monet, they also clearly anticipate the future work of Henri de Toulouse-Lautrec. Although Somm was 20 years older than Toulouse-Lautrec, both artists developed a friendship, as habitués of the Chat noir, a cabaret founded by Rodolphe Salis and located 84 boulevard de Rochechouart in Montmartre. More than a cabaret, the Chat noir also became an important gathering place for writers, poets, composers, musicians, and artists living in Montmartre. For Somm, a founding member of this artistic circle, it also served as a unique environment, where he could express his limitless imagination as active participant to the events – notably the literary soirées organized by the hydropathic group – and illustrator of the Chat noir journal. In 1886, Somm, in collaboration with Georges Auriol, initiated the Chat noir’s first puppet show, which subsequently evolved into shadow theater. Somm’s Japonism and sense of humor appealed to Toulouse-Lautrec, and this influence is echoed in Lautrec posters advertising two other Montmartre nightspots, namely Le Mirliton and Le Divan Japonais. 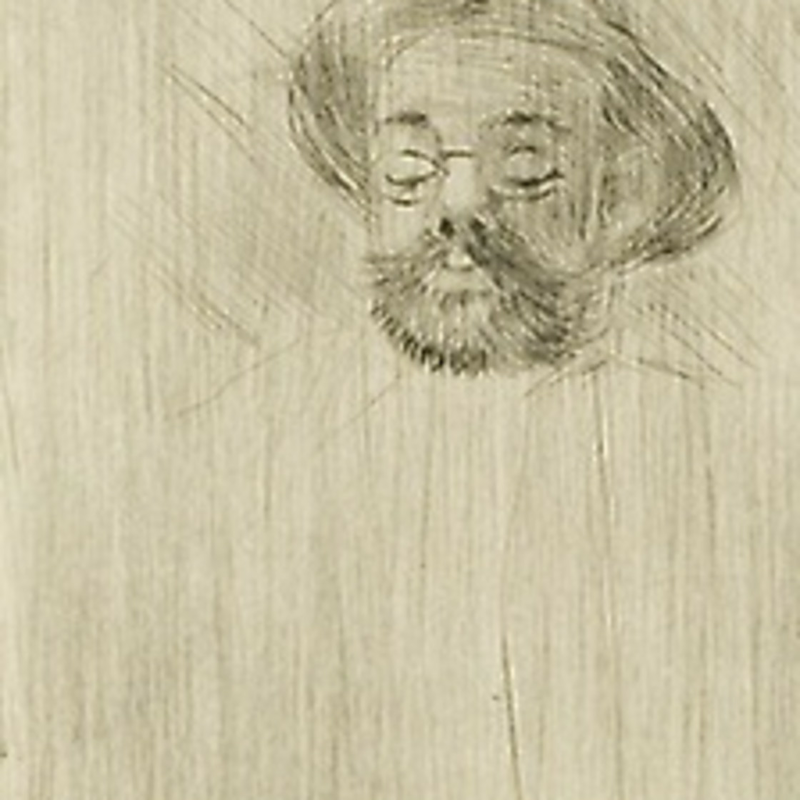 Toulouse-Lautrec is also one of the rare artists to have drawn portraits of Somm.